At McPherson Family Eye Care our primary eye doctors provide the very best eye exams in Wake Forest for the entire family. Our doctors are leaders in their fields and offer diverse areas of expertise to provide the very best vision and medical care. At the core of great vision care is the comprehensive annual eye exam. This essential maintenance visit is an opportunity for you to and your optometrist to discuss changes in your health, screen for potential problems, and make corrective changes. 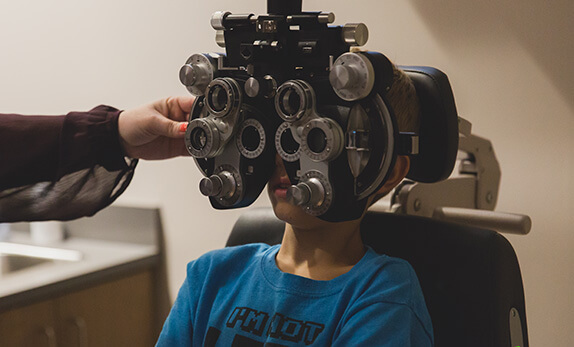 Our priority is that you are completely comfortable with your plan of care; that begins with having ample time to communicate with the staff and your optometrist. Healthy vision is critical for your child’s development and education. That’s why our staff and doctors are trained in providing comprehensive eye care, vision care, and vision therapy for children of all ages. You’re going to have those eyes for a long time, let’s take care of them properly. Routine exams and screenings are important for every adult, especially if you are managing corrected vision or a known medical condition. Routine exams are even more important for seniors (60+). Since many health problems can impact on your eyes, having a regular dialogue with your doctor can help identify diseases and potential issues early on, and make a plan for managing them. Low vision is missing or blurred vision typically caused by an underlying medical condition. Our doctors specializing in low vision offer a variety of solutions to help you manage your low vision and live with as much independence as possible. A low vision appointment is not like other eye appointments. Your doctor will perform testing to establish what your vision is like now and how it can be improved. You will also work with your doctor to set realistic, achievable goals for reclaiming the lifestyle you want. We are available 24 hours a day to care for any ocular emergencies (i.e. injuries, infections, etc.). Please call the number below if you are in need of after-hours care. Only a Functional Vision evaluation will diagnose a Functional Vision problem. When a functional Vision problem is diagnosed Vision Therapy can help correct by retraining a person’s visual system to work properly. Get the glasses you want faster. Find your personal style among our 2000 frames and sunglasses. We cut your lenses in-house so you can get your new glasses faster.